We come by night, past the ruins of Tintern Abbey, gently lit, and on, up further, climbing and winding through the inky black. This is some of the most stirring country on Earth, all ‘steep woods and lofty cliffs’, ancient and mighty, fecund even in the winter’s depth. Yet Wordsworth’s ‘wild secluded scene’ is shrouded in the deepest dark, and lost in the Monmouthshire gloom. As are we. Sort of. Lost, that is. Are you sure it’s up here?’ I ask Matthew, panicked by the lack of signal. The satnav has died and more primal instincts take over. ‘Have faith,’ he mutters. ‘I know it’s here somewhere.’ But as the road narrows, so too do our hopes of dinner. Then a flash of pale wood, a sign, The Whitebrook, and a gentle exhortation to turn left. Oh aching joys and dizzy raptures and all that. We’ve arrived. In a car park, under a clear sky and blanket of stars, and the river not so much ‘soft inland murmurs’ as gushing, tumultuous thunder. Inside, though, all is discreetly quiet, save the low tinkle of jazz. We sit, and sip icy manzanilla sherry, in a low-ceilinged, comfortable room with an old-fashioned feel. It’s here that menus are perused, discussed and ordered before venturing next door. The room fills slowly, decorously, conversations held in muted tones. The sommelier persuades us to choose a cheaper wine, a welcome relief from the usual upsell. And we chew bread, brown or white, nothing fancy, yet just as home-made bread should taste. Chef proprietor Chris Harrod is modest and softly-spoken and tells of the travails of being up here. ‘It snows and we’re stuck,’ he says with a smile. ‘No one in, no one out.’ The menu is tasting only, yet somehow, we don’t feel enslaved by its usual tyranny. There’s a bowl filled with plump nutty barley, mixed with Barkham Blue and stuff gathered from the local hedges. Tree cabbage? Scurvy grass? God knows. They add verdant, gently bitter crunch, the first shoots of spring. Roasted Jerusalem artichoke is the very essence of sweet winter, balanced with the creamy, lactic bite of a delicate goat’s curd. The odd crunch of seed, and yet more ‘forest findings’, or foraged bits, add texture and nuance. There’s a handsome scallop, burnished with butter, the interior beautifully opaque. A smooth parsnip purée accentuates the shellfish’s sweetness, while plum pickle provides an acidic whip crack. Harrod’s cooking is technically skilled but unshowy, his understanding of balance sublime. It wouldn’t be a modern tasting menu without cauliflower, and so it appears, roasted with pickled onion and ramson buds and crisp kale, far greater than the sum of its parts. A taut piece of turbot comes with mussels and purple sprouting, an edible snapshot of the season. The fish is very much the star. Just like the local Ryeland hogget that graze on the banks of the Wye. This is a serious piece of sheep, some of the best I’ve tasted. A pink lozenge of loin, and slow-cooked breast, cut through with a ribbon of fat. And something with the liver too. This beast didn’t die in vain. Around us the atmosphere gets a little more jovial as glasses are emptied and voices raised. ‘I don’t want to fall in love,’ croons Chris Rea as we devour the famed suckling pig, belly pork with immaculate crackling, a pale pink chop and a crisp cylinder filled with piggy bits. This is subtle, precise, intelligent cooking that gives one an absolute sense of place. With no need to shout or swagger. We finish with pudding, poached pears with buttermilk. And blackcurrant granita with camomile. Eight courses, yet we don’t feel stuffed. The lights are now low, the room suffused in well-fed bonhomie. Outside, the Wye rumbles on. As some of you may have heard, we had some rather sad news last month. Not only was one of our barns severely damaged by a fire but we also lost nine of our Middle White pigs in the process. We pride ourselves on the excellent quality of life we provide our animals with and take a vested interest in the health and wellbeing of each and every one of them, so this incident was particularly devastating for the whole team. 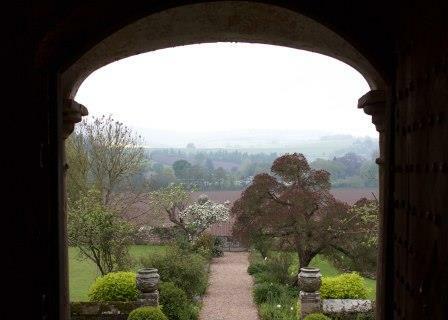 Thankfully the building is now undergoing repair and things are looking up this month at Huntsham. We continue to welcome new additions to our Middle White family with new piglets being born at Huntsham and several more of our pigs ready to farrow. The farm is a hive of activity and the fields behind the farmhouse are no exception. 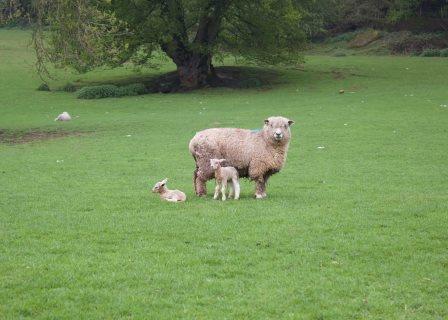 Here you will find our flock of Ryeland sheep grazing on the lush grass and the new lambs getting acquainted with their surroundings. Our Longhorn cattle are sharing their time between the field and their comfy shed. Meanwhile, some of our other fields are taking on a new lease of life of the arable nature. 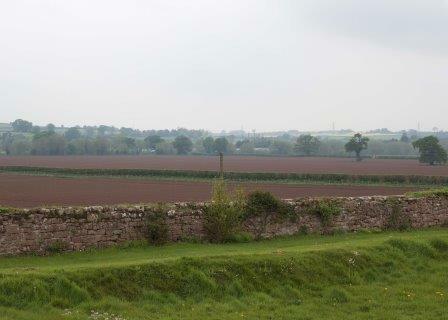 The fields located between the farmhouse and the meandering River Wye have currently been planted with potatoes! The farmhouse itself is undergoing some renovations too but you can still find some peace and quite in the beautiful garden. Just look at the lovely view through the dining room doorway. The new product knocked Rogan’s socks off, too. “I’d put his dry-aged pork on a par with the best Iberico any day,” he says. “The fact that it’s British is just the icing on the cake.” He now has it on the menu at both Fera and the French. 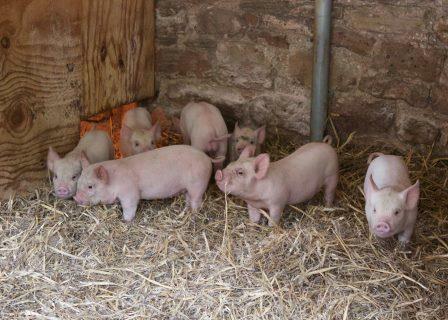 In Ross-on-Wye, at Huntsham Court Farm, farmer Richard Vaughan produces 55-day-age rare breed Middle White pigs. He accepts it’s unconventional. “A few years ago [Chef] Nuno Mendes asked if we could do a 40-day hung pork. The abattoir I was using then said I was mad. But it didn’t go green and I sent it to Nuno. So I tried more carcases in better fridges and sent then to Sat Bains, Marcus Wareing, Michel Roux and Jeremy Lee. The feedback was it was outstanding. “Now, so prized is the sweet nutty hog that Simon Rogan recently plated it with charred spring onion, abalone mushroom, Jersey Royals and nasturtium at Fera at Claridge’s for the world’s 50 Best Restaurant awards party. We are blowing our own trumpet but are very proud that Simon Rogan used our 55-day dry-aged Middle White Pork for the main course of the dinner which was held in his restaurant, Fera at Claridge’s, to celebrate this year’s ‘World’s 50 Best Restaurants’ awards. Try-tips”haute” dogs and “air-chilled” chickens would not have featured highly among new products in the meat and poultry industry a few years ago, but now such dishes, cuts and processes are part of a global inspired revolution that is shaking up the sector. It is a burgeoning market where revival of traditions is married to cutting-edge invention; where operators and chefs, and by implication their customers have never enjoyed such diversity. One part of the story is being played out in an idyllic corner of rural Herefordshire. 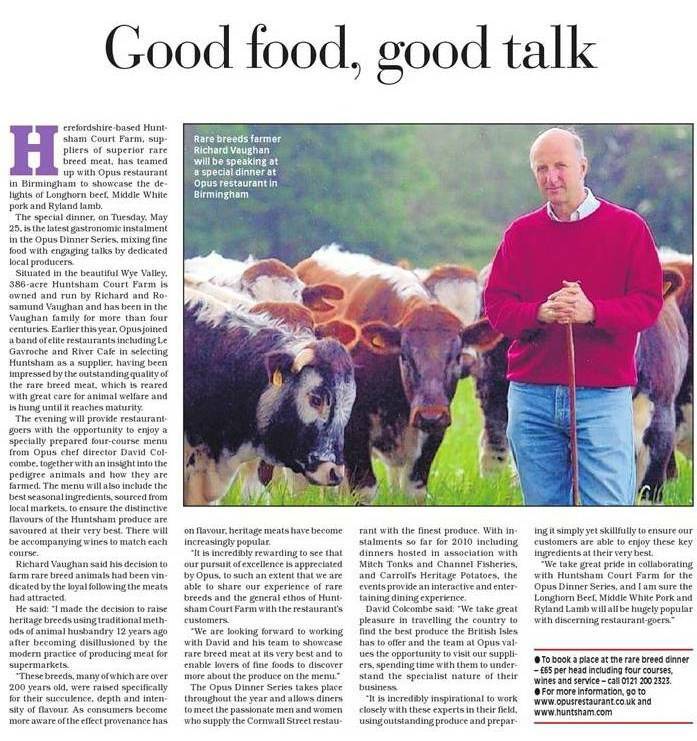 It is here that Richard Vaughan of Huntsham Court Farm, Ross-on-Wye, turned his back on industrial-scale farming to become a specialist meat producer more than 20 years ago. If it seemed like a fanciful, high-risk strategy at the time, Vaughan is now well-placed in a market where high-end chefs demand both quality and a point of difference. 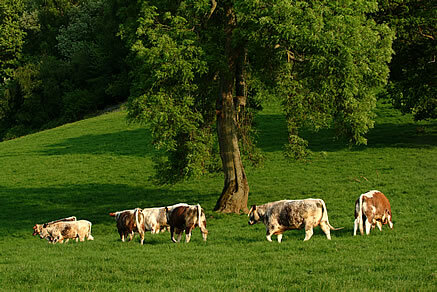 By focusing on slow-reared rare breeds – Longhorn cattle for beef, Middle White for pork and Ryeland for lamb – Vaughan lets the natural flavour enhancement of his products speak for itself. It was following a request from Nuno Mendes of Chiltern Firehouse to experiment with a 40-day aged pig that Vaughan turned to hanging some Middle Whites for 55 days. The standard hanging is 13 days. “It has been hailed as delivering the wow factor” says Vaughan, whose customers include chefs Brett Graham, Marcus Wareing and Simon Rogan. “The extra hanging develops the pork flavour but it is not a ‘fridgey’ taste. You get an intensified flavour. What we are tryng to do is produce things that give chefs the edge”. That incldes ageing a Longhorn for 75 days, as opposed to the standard 32-day hanging. Described by Jamie Oliver as the “Oscars of the food world”, the awards were created in 2000 to celebrate the people and organisations that produce and promote the best of British food. The awards, nominated by listeners, set out to find the Best Local Food Retailer; Best Take-Away; Farmer of The Year; Best Dinner Lady or Man; Best Food Producer; Best Retail Initiative; Best Food Market and the Derek Cooper Award. 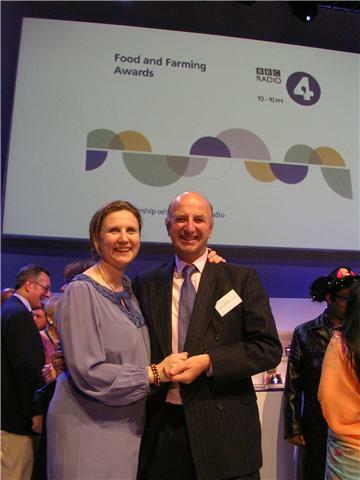 Chair of judges Angela Hartnett (shown standing next to Richard) says: “This is a really inspirational group of finalists and what’s so important about the awards is that, for many of them, making it on to this list will be the first time they’ve had their work recognised. Huntsham Court Farm was nominated and shortlisted for the category of ‘Best Food Producer‘ along with two other producers. Whilst we did not win, we were honoured that our meat was considered to be some of the best in the country. Thanks to all of you who nominated and voted for us. 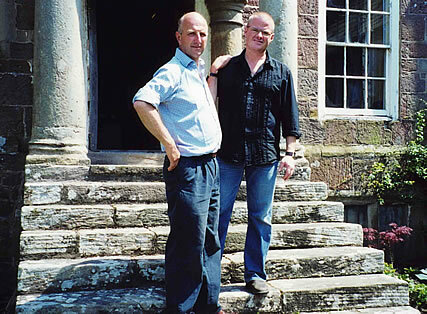 Richard Vaughan’s Longhorn beef was chosen by Heston Blumenthal for his television series “Perfection”. I get my Longhorn beef aged for 33 days and my Middle White pigs – the best crackling this side of heaven with a thick, white ribbon of fat – through the post from Richard Vaughan at Huntsham. The beef is unparallelled. No one could say that the Middle White pig is a looker – its short-snouted, squashed (what pig fanciers term ‘dished’) face and Gollum-esque ears would never have secured it any body-double work on Babe. But what it lacks in beauty it makes up for in the quality of its pork. 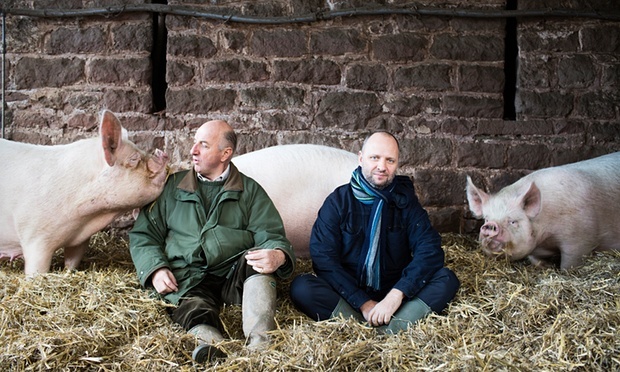 And the man who breeds some of the best is Richard Vaughan, of Huntsham Court Farm, Ross-on-Wye, Herefordshire; whenever the UK’s best chefs need to source top-drawer pork, his is the number they call. Try this for an impressive client list: Heston Blumenthal is a customer, as is Dominic Chapman, head chef at Heston’s Hinds Head pub. Jeremy Lee, head chef at Terence Conran’s Blueprint Café, also places regular orders. Also on the roll call are Sam and Sam Clark of Moro restaurant, Bruce Poole of Chez Bruce, (‘Middle White is the best pork I’ve ever eaten’) , Fergus Henderson of St John and Rose Gray and Ruth Rogers of the River Café. Huntsham hasn’t always occupied the top end of the meat producing market, though. The farm has been in Richard’s family for 400 years, and he’s been at the helm for 35, initially producing beef on a large scale for all the major supermarkets. It was a chance conversation with his local abattoir that changed all that. Realising he’d unexpectedly run out of joints of beef to cook at home, he rang them to ask for one from an animal they’d slaughtered for him. Their response – that they could supply him but that they would prefer to give him meat from another producer as they didn’t rate the quality of his own herd – was a jaw-dropping moment. As a result, in 1996 he abandoned large-scale animal farming to concentrate on the small-scale production of pedigree animals selected for the excellence of their meat. Initially Richard experimented with other rare breeds but it was the Middle White that won the pork taste every time. Considering the animal’s history, it’s not such a surprise. 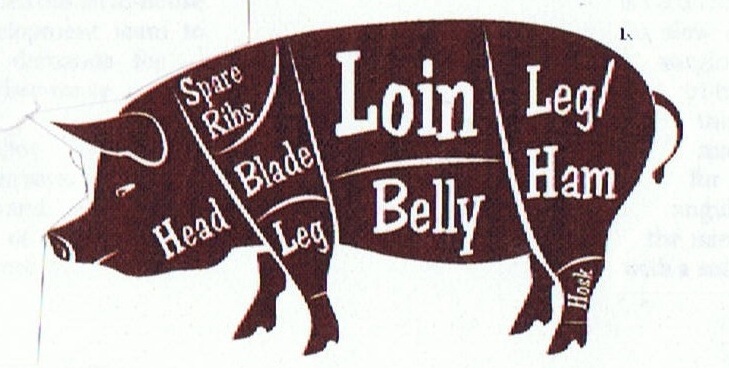 First recognised as a breed back in 1852, it’s the only British pig that was bred specifically for pork, producing an animal that carried a lot of flesh, with enough fat to give it flavour, but not so much that it compromised the quality of the meat. Once hugely popular for these qualities, by 1973 it was in major decline and designated a rare breed pig (meaning there are less than 1,000 adult females in existence). The fact that Richard rears them for their meat doesn’t put the breed’s survival in jeopardy – if he and other rare breed farmers weren’t encouraging people to eat Middle White pork, the breed would die out altogether. It’s not just the Middle White‘s natural characteristics that mean its meat is top quality – Richard’s husbandry techniques also have a huge role to play. His philosophy is simple: give them a happy life. Unlike intensively farmed pigs, which are frequently kept in the smallest space legally allowed, Huntsham pigs have the run of the farm. When the weather’s good, they’re out grazing the fields with the Longhorn beef and Ryeland lamb (both rare breeds) Richard also farms. When it’s bad they shelter in barns supplied with plenty of straw for bedding and recreation. His approach to their feed is similarly straightforward; free from the growth promoters often fed to intensively farmed pigs, it’s a mix of cereals, soya bean meals, peas and beans – all top sources of pig-friendly protein. That neither the feed, nor Richard’s farming methods, are organic clearly hasn’t been a problem for the chefs who buy from him – in fact, Henry Harris, of London’s Racine restaurant, insists Richard’s Middle White ‘has a flavour that surpasses even the finest of organically reared porkers’. And, as for the bog standard pork you’ll find on most supermarket shelves, there’s no comparison. That kind of pork comes from pigs bred for bacon, whose more muscular, leaner meat is fine for rashers but just can’t supply the succulent, unctuous taste and texture you need for a decent cut of pork. No fat no flavour – it’s that simple. Richard no longer counts supermarkets among his customers – he just can’t produce enough. Not that he’s worried: ‘If the supermarkets say “We’ll pay you x pence a kilo”, then it’s down to you to bring your costs down below x pence a kilo to make any kind of a profit. Instead, we ask ourselves what we need to spend to make a quality product, then price accordingly. Our only consideration is producing pork people think is delicious’. Looks like he’s done the job. We Brits are an odd bunch, a nation fast to react to a crisis but also a nation with incredibly short memories. Take the BSE problem. Once it was discovered that the disease could cause new variant CJD, beef sales plummeted overnight. And yet as soon as supermarkets slashed beef prices the meat sold like never before – anything for a bargain. The time is ripe to change our attitudes. If we learn one lesson from recent farming problems it must be to spend more money on food – especially meat – to achieve safety and quality. We don’t need to eat so much meat: far better to eat meat less often but, when we do, to pay more for a quality product. On Easter Sunday I ate the most brilliant leg and belly of Middle White pork. Ever since I tasted Middle White at a rare breed tasting some time ago I have been hooked. Eating normal supermarket pork now is like eating cardboard. There is no comparison: Middle White is juicy, it’s incredibly tender and the crackling works a treat. I liked the product so much I bought two live animals for my smallholding, which I have successfully bred to produce 14 piglets. Oh no, I can hear you cry, he’s not going to eat them! Get real, guys, that’s why we have 60 million animals in the UK – they’re for eating. But unlike most of the intensively reared animals, my animals will have had a life. They will have felt the warmth of the sun, they will have rolled in their mud baths, they will have been well treated, and for their short time on this earth will have enjoyed themselves. Once the foot and mouth crisis is over you’ll be able to buy this marvellous meat directly from him. Trust me and you’ll never return to supermarket pork again… Slowly, slowly we’ll get the message across to supermarkets to think quality before quantity. According to Richard Vaughan, owner of Pedigree Meats of Herefordshire, the meat that is generally available in our shops, especially in supermarket chilled-food cabinets, is often tasteless and cardboard textured because it is too lean and from the wrong breeds of animal. In addition, beef is not hung enough (to save money on storage and moisture loss). The starting point in Richard’s quest for excellence is the breed: Longhorn cattle, the breed that originally made British beef famous, critically rare Middle White pigs and Ryeland sheep. Meat from one of these animals is, indeed, a taste – and texture – revelation. Customers must first register, and are then contacted when meat becomes available. Each order is vacuum-packed and cut and jointed to customer’s specifications. 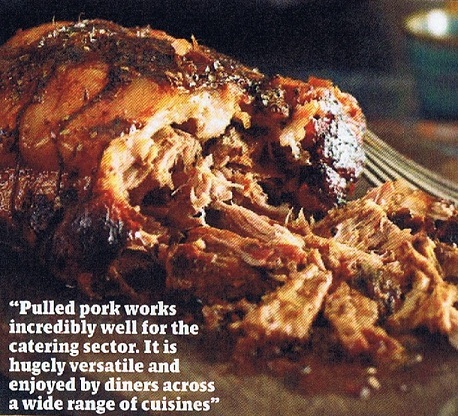 We love Gary Rhodes 4-hour pork (January issue) – but now we love it even more made with a shoulder of Richard Vaughan’s pedigree Middle White pork. It also makes the best crackling ever… If you’ve got room in the freezer call 01600 890296 for mail order. Ghastly things appear on the Weekend FT’s food desk. Packet soups. Supermarket “chill-fresh” meals that I would not even give to my dog. Veggie burgers. New snack products, composed largely of salt. 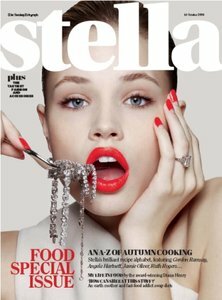 And – the latest revolting trend – cook in bottled sauces. But, now and again, out of the blue, something special arrives. It happened a few weeks ago, a while after Richard and Sue Vaughan had been slaughtering pigs and cattle on the their Herefordshire Farm. They sent me a joint each of Longhorn Beef and Middle White Pork. The beef was fine – deep red, properly hung, with a good texture, but the pork… the pork was a revelation. It was sweet, succulent and full of flavour. 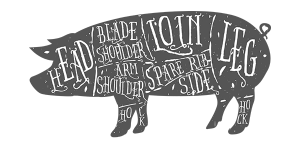 Now, I pride myself on having a good butcher, but there is no doubt that the craze for larger, leaner pigs is making it much harder for butcher and consumer to obtain top quality pork – which means pork that has a proper amount of fat. As for supermarket pork, it is, sadly, hardly worth a second glance. It could be argued that people who rustle around in cold cabinets looking at plastic-packaged joints of immaculate size, shape and bland taste, deserve little sympathy, but there is always a case for the re-education of people’s shopping habits and taste-buds. This has been reinforced by the latest UK government health warning. We are urged to cut our consumption of red meat – even those who consume as little as 90g a day (about eight or ten portions a week). All the more reason then, to seek out the highest possible quality when you do consume your daily allowance. What with health scares and bad shopping habits, it is no wonder that pork consumption has fallen in the UK. In the European Union as a whole last year, 15,349,000 tonnes of pork were eaten, according to latest estimates. The Germans were the largest consumers with 4,506,000 tonnes, while the UK consumed just 776,000 – but another 468,000 tonnes of bacon. The Vaughans have operated farm visits for 11 years, but these will stop at the end of the season to concentrate on the breeding of pedigree livestock. This is a brave – or foolhardy – decision, depending on your point of view, particularly when the agricultural press is full of stories of small farmers going out of business, family farms being absorbed into PIG-U-LIKE plc, or some such combine, and of set aside and the latest EU directives. Earlier this century, Middle White was the choice of many a quality pig breeder in England. If the Vaughans can go even a little way towards reviving this breed, they will have performed a service to the discerning customer. Customers are welcome to visit the Vaughans and see the conditions under which their animals are reared and fed. The latest feather in the Vaughans cap was success at this year’s Monmouth Show, in Gwent, when one of their bulls was made Longhorn breed champion and went on to win the interbreed championship against all comers. 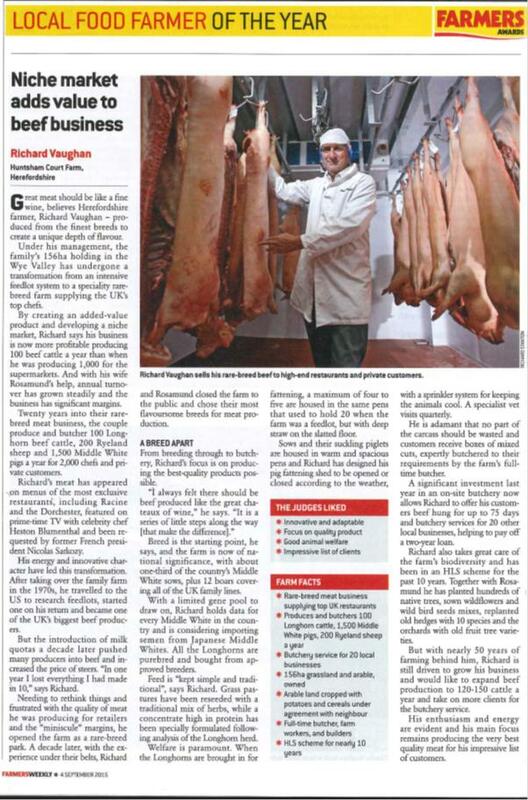 The Vaughans’ company, Huntsham Farm – Pedigree Meats, is offering its meat on an “as available” basis because it cannot maintain constant supply, a point that will no doubt be seized on by the massed ranks of supermarket purchasers. It is supplied in insulated boxes containing between 16kg and 20kg (25lb and 44lb) of mixed cuts and joints. All the meat is suitable for home freezing – but why not share an order with neighbours? – and the company is happy to discuss individual butchering requirements.